Red Kidney Bean Poisoning etc. 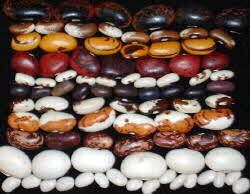 Be sure to buy dried beans from a source that has good turnover. The longer they sit on the shelf, the drier they become and the longer the beans will take to cook. Once you get them home, store dried beans in an airtight container in a cool, dark place. Dried beans should be soaked, and the water changed, to soften them (which reduces cooking time), but mainly to dissolve some of the gas producing compounds which make the beans easier to digest. Wait to add lemon juice, vinegar, tomatoes, chili sauce, ketchup, molasses, wine and other ingredients rich in calcium or acids, which can prevent beans from becoming tender. Add after beans have been fully cooked. Salt will toughen the beans during the cooking process, so only add it when the beans are almost tender. Do not add salt to the soaking water. Natural foam or scum in the cooking water? -- Don’t worry. If you see brown foam in the pot, this isn’t dirt. It’s the protein from the beans coagulating on the surface. Simply skim off. A bit of butter or oil will prevent foaming. It takes about 2 pounds of dried beans to make 1½ gallons of soup. Legumes may cause intestinal discomfort - You can minimize this effect by changing the soaking water several times when you prepare dried beans, or switching to canned beans. When canned, some of the gas-producing substances are eliminated. Be sure to rinse the beans well to wash off excess salt. Another option is ‘Beano’, which contains an enzyme that breaks down gas-producing substances in the beans. One 15-ounce can of beans = 1½ cups cooked beans, drained. Sprinkle cumin onto beans while cooking and serve with rice and a salad for a quick complete meal. Be sure to serve beans with vitamin C rich vegetables to help iron from the beans be better absorbed. Don't limit beans to just entrée dishes or soups, use them for dips, in salads, and dessert! Substitute beans for a meatless meal 1 to 2 times a week.